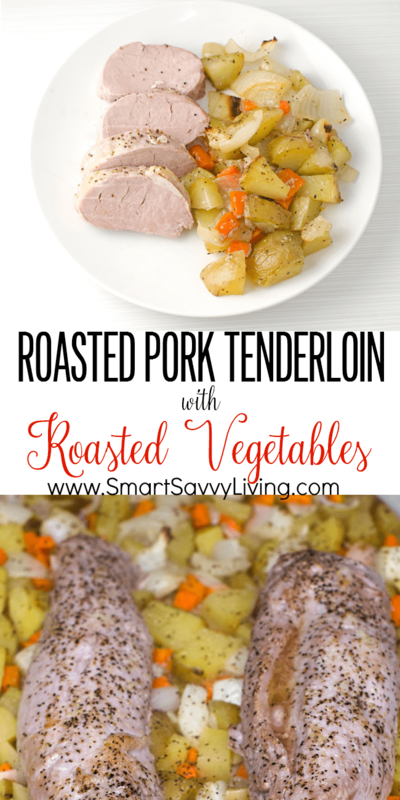 This pork tenderloin with roasted vegetables recipe is part of a sponsored post for SheSpeaks/Smithfield at Walmart. Many of us are counting down the days until Christmas. If you’ll be having family or friends staying with you in the days before or after, you’re probably stressing even more. We all strive to have the perfect Christmas Eve and Christmas Day meals. But, when you’re entertaining guests the days before, you want to be able to serve a tasty, healthy dinner, preferably without a lot of dishes or prep work. 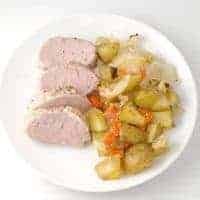 That’s why I love this one-pan pork tenderloin with roasted vegetables recipe. There are just a few minutes of prep and everything cooks together for an all-in-one hearty and flavorful meal. It’s also totally customizable to whatever flavors you like. This time, I kept it simple with olive oil, salt, pepper and garlic powder and used carrots, potatoes, and onions for the veggies. If I have them on hand I also like to add in parsnips, beets, sweet potatoes and/or butternut squash. You can also add some herbs if you’d like, such as rosemary and thyme. All the different colors look so pretty together and a roast is always a fancy looking meal to serve to guests no matter the time of year in my opinion. I, of course, always use Smithfield All Natural Pork in my pork recipes. It’s always been my preferred brand of pork, but I have to say I love using it even more now that Smithfield, VA is just a hop, skip, and jump away from where we live and get to see how they provide local jobs and help both local and national causes first hand. 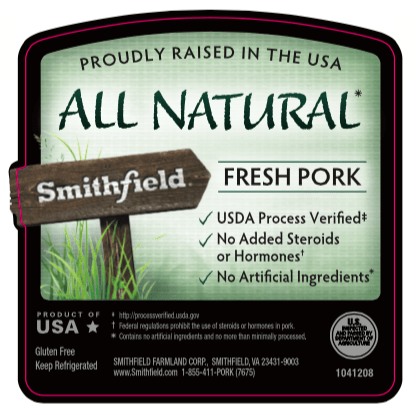 I also love using Smithfield because they offer all natural products using animals proudly raised in the USA and meeting the USDA Process Verified standard. Smithfield also never adds steroids, hormones, or artificial ingredients to their products. 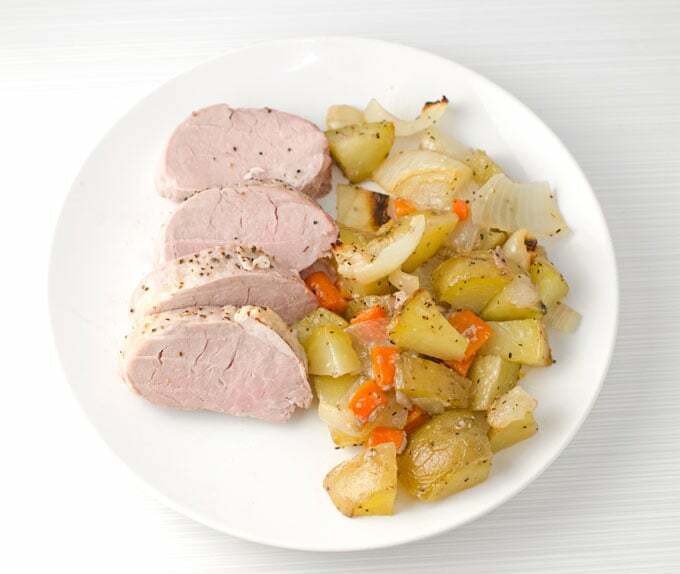 Here’s how to put this delicious roasted pork tenderloin and veggies together. This pork tenderloin with roasted vegetables recipe is quick, easy, and only takes one pan to make. Prep veggies by thoroughly scrubbing, peeling if necessary, and cutting into medium chunks. It's important to chop vegetables in as similar of size as possible so they all get done at the same time. Line a half sheet with parchment paper or foil for easy cleaning, or spray pan with cooking spray and pour prepared veggies onto the sheet. Drizzle with olive oil and sprinkle with salt, pepper, and garlic. Stir to coat all the veggies and then spread them out into an even layer. 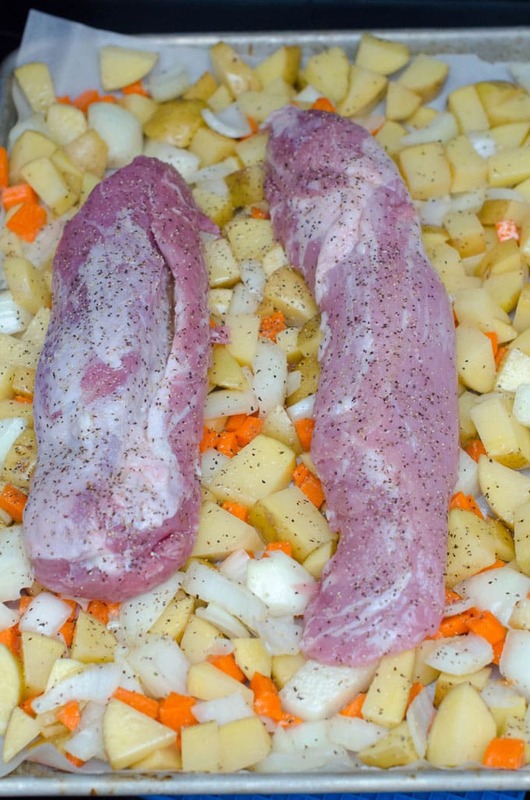 Remove pork tenderloins from all packaging. I like to them rinse them and pat dry with paper towels. Place tenderloins on top of the veggies in the center of the pan. Coat all sides lightly with olive oil and season all sides with salt, pepper and garlic as well. Leave the fattier side up. 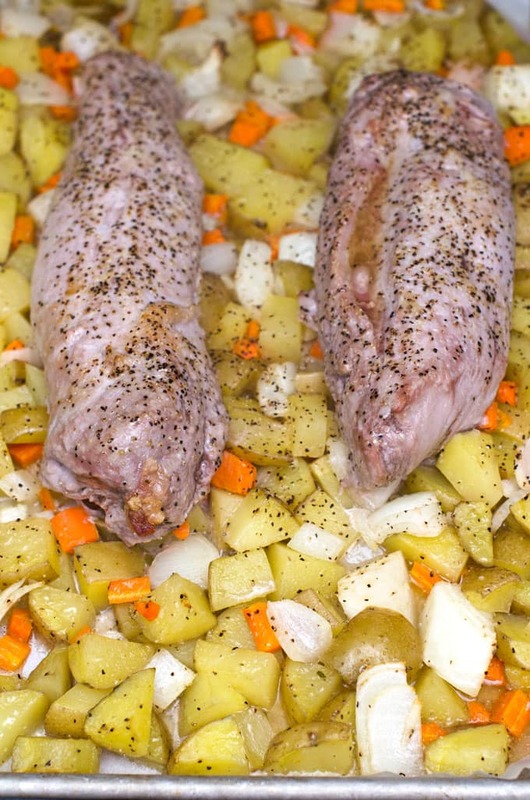 Place the pan in the preheated oven and roast for 20 - 30 minutes or until the pork tenderloins have an internal temperature of at least 145°F, keeping in mind the meat temperature should rise 3 - 5° while resting. Place tenderloins on a cutting board and lightly wrap in foil. Give the veggies a stir and return to the oven for another 20 minutes or until fork tender. When veggies are done, slice up the pork as desired and serve pork and veggies immediately. Be sure to visit Smithfield on Facebook and Twitter for more pork recipe ideas!